If you're one of those users who continually laments the lack of expandable storage options from high-end smartphones or tablets, Seagate would like a word. The well-known hard drive manufacturer is releasing a somewhat unconventional model aimed squarely at mobile devices. The Seagate Wireless (that's the full name of the drive) is a 500GB hard drive with a built-in power supply and a Wi-Fi radio for accessing files on the go. In and of itself, that's not all that interesting - we've seen similar products before. But Seagate seems to have put a bit more thought into the Wireless. First and foremost, it's designed to handle direct Wi-Fi connections from your phone or tablet to the drive for accessing media or transferring files - no hotspot necessary. It can technically handle an active streaming connection to three devices at once. Secondly, the Seagate Media app makes actually getting to all those videos, photos, and music files much easier with a built-in media player, saving you the hassle of searching through a file manager or manually copying and pasting. The Media app is available on the Play Store and Amazon Appstore, and also works for iOS and Windows 8 devices if you happen to have them. The app will stream its content to the Chromecast, as well as specialized apps for the Roku, Samsung and LG smart televisions, and Airplay. So what will this portable convenience cost you? Seagate will ask $130 for the 500GB Wireless, the only capacity announced thus far, when it debuts at retailers in February. You can pick it up in a handful of fashionable colors. Seagate also announced its new Personal Cloud ahead of CES, a home server with streaming capabilities to all major mobile platforms that also provides a local backup for services like Google Drive and Dropbox. Single and dual-bay versions were announced, but no date or price was mentioned. LAS VEGAS--(BUSINESS WIRE)--Seagate Technology plc (NASDAQ: STX), the pioneer in wireless storage, continues to grow its family of wireless storage solutions with the debut of Seagate® Wireless, a 500GB portable wireless drive designed for streaming and offloading of media from mobile devices. 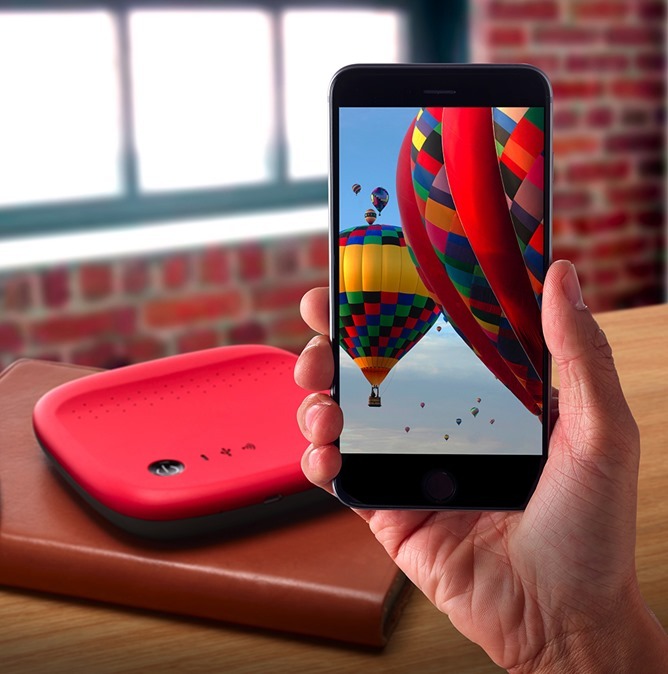 The new Seagate Wireless offers more space to carry everything consumers want on their mobile devices and alleviates the challenge of running out of storage space on smartphones and tablets. Seagate Wireless provides a solution to stream your favorite HD video on your Android Tabletor Smartphone, iPad, iPhone, Kindle Fire, Windows 8 computers and Windows RT tablets. With space for up to 200 HD movies, people will never be without entertainment, even when on the road without Internet access. By freeing up precious space on people’s tablets and smart phones, the Seagate Wireless drive will become a mobile devices’ favorite companion. Enjoying saved content is now a social activity when using Seagate Wireless, which provides the capability to share the contents of the drive with streams for up to three connected devices simultaneously. Seagate Wireless storage is accessed through the free mobile Seagate Media app for Apple iOS, Android, Kindle Fire HD, Windows 8 tablets. Mobile devices connect to Seagate Wireless over a Wi-Fi connection, which the battery-powered drive emits once powered on. Simply connect to the drive by searching for Seagate Wireless in available Wi-Fi networks from any device. The drive emits its own Wi-Fi signal, eliminating the need to be within range of an existing network connection. Seagate Wireless will be available from Amazon, Best Buy and Seagate.com by early February for a MSRP of $129.99. Seagate Media app is currently available for free from popular app stores.